I've jumped on the bandwagon of cutie-fying everything. Okay, not everything. My son Reuben doesn't need any help in that department...and some things, like the fridge, are functional without hope. But I love jar covers, and since my son's birth I've developed a serious obsession with foxes (he has fox everything) and I even bought a pair of fox leggings and a fox necklace! So a crochet fox cozy that covers a mason jar is not a leap into the dark for us. And guess what--I love it! 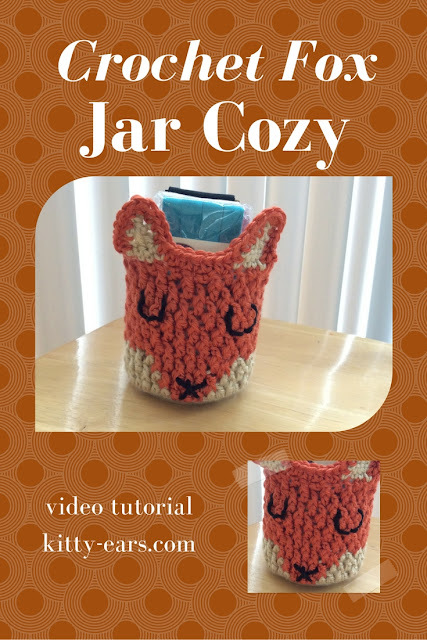 You will need a 4.5mm crochet hook and worsted weight yarn to make Mr. Fox. I used simply soft (a walmart brand). Half a skein is more than enough for one cozy. You could probably make four of them from half a skein!